Maximize the available space in your Fall River bathroom remodeling project by using semi-custom solutions for top quality bathroom cabinets. Solid maple bathroom vanities add a touch of luxury to any space, offering long-lasting, great-looking results that will create a focal point in your design. A wide selection of bathroom vanities for Fall River, MA remodeling can be found at our showroom located in Swansea. The Cabinet Factory Outlet has a variety of vanities, cabinets, cupboards, specialty cabinets and accessories that you can use to create semi-custom results on just about any budget. The average homeowner spends upwards of $12,000 to remodel a bathroom, but you can cut that cost considerably by being smart with your spending at the Cabinet Factory Outlet. Browse the different styles, colors, and designs at our showroom to find the look and feel that you have always wanted for your home. We can show you extra elements to enhance storage, function, and aesthetic appeal, upgrading your basic solid maple bathroom vanities to luxury status with just a few additions. Door knobs, drawer pulls, matching toe kicks and molding – there are lots of great ways to get that luxury look for less when you take the time to explore all of your options. This is the first question that you should ask yourself. Are you tired of the floorplan, which can make it awkward to use or wastes valuable space? Is it more about the color and design, which is outdated or doesn’t go with the rest of the home decor? 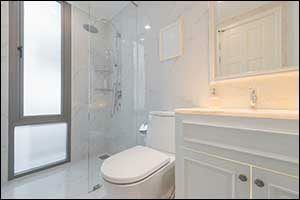 Would you like to upgrade fixtures, faucets, showers, bathtubs, sinks, flooring, and other elements as well? The more you can identify what you don’t like about your existing bathroom, the easier it will be to figure out what you want for your new Fall River bathroom remodeling project. When you visit our showroom in Swansea and take a look at the options available in solid maple bathroom vanities you will be impressed. A significant step above home improvement store quality stock cabinets, our bathroom vanities, cabinets, and accessories are all still well within your budget. When you combine all of the extra elements that you desire with our cabinets and vanities for Fall River bathroom remodeling, you get a truly semi-custom look that will appear to have cost you thousands more than you’ll actually spend. Customizing your bathroom with unique accessories and options can help you stretch your dollar for bathroom vanities in Fall River, MA without breaking the bank. We are open to the public, providing quality materials for Greater Fall River bathroom remodeling at our showroom in Swansea, MA. Conveniently located on Grand Army of the Republic Highway, you can view all of our options for top quality bathroom cabinets and vanities Tuesday through Saturday between 9 am and 5 pm. Bring your designer or contractor, as we sell our materials to homeowners, property owners, architects, builders, and other professionals. When you visit our showroom you can expect to see a variety of different colors, styles, sizes, and types of solid maple bathroom vanities, cabinets, and cupboards that you can use to create a beautiful bathroom, regardless of your budget. Give us a call at 508-379-6154 or browse our website to see examples of our Designer, Craftsman, and Craftsman Premier Series cabinetry.